Buying your first set of woodturning tools can be confusing - there is so much choice and it is difficult to know where to start. I would always advise a beginner to seek advice from a recognised professional before they consult any other source. Many people think that the Internet is a good place to start, but I would always suggest asking a professional over this method. 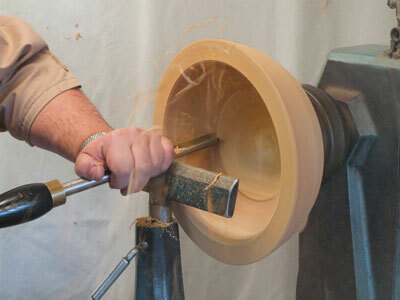 Woodturning tools today are generally made from High Speed Steel (HSS) but there are also a myriad of flute shapes, gouges and terminology which can lead to further confusion for new woodturners. Words such as super flute, swept back grind, radius edge, diamond or swan neck, can all seem like a foreign language to the amateur turner and can mean very little if not explained properly. This helpful guide aims to dispel common myths and shows you what basic turning tools you need to have in your workshop. tools, speak to a professional/experienced turner to ensure that these pitfalls are avoided. Once you have purchased your turning tools do not assume that they have the correct bevel angle or style of grind required by modern turners; they may require re-grinding a number of times before they feel right to use. Box-sets can often include tools not entirely appropriate and many basic tools are often supplied with shortened bowl gouges or handles to enable them to fit in the packaging, which can compromise their usefulness. Once purchased, new tools may not immediately be ready to use as they may well have been damaged in transit from the manufacturer or not be sharpened ready for use. 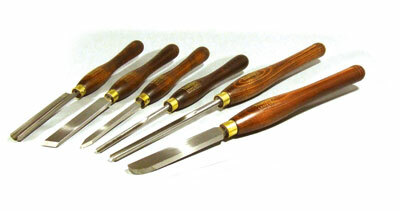 Many turners, depending on personal choice, may use different grinds and the same applies to handle length. Initially, keep things simple and follow some basic angles, but remember it will take some time to become proficient with grinding and sharpening. (We will discuss sharpening and how to use the tools in futre articles in the series). This tool is used to rapidly remove waste timber on spindles (timber where the grain runs parralel to the axis of the lathe bed). It can be used to removed square edges to make the timber round or to create gentle curves. 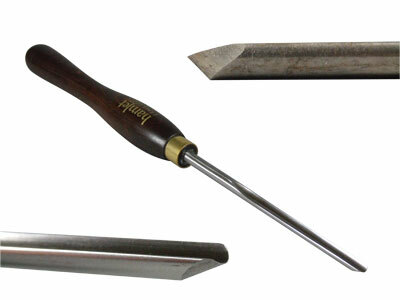 Although this tool is often supplied in a form that is ready to use, it will require sharpening beforehand. A good starting size to choose is 19mm (3/4in). 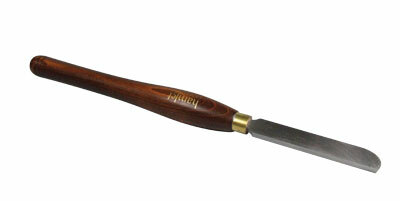 This is probably the most versatile tool available to woodturners, but is often misunderstood. it is effectievly the plane of the woodturner's tool kit. Often called troublesome, a little effort learning how to use it will show it is capable of smoothing cuts, cutting beads, fillets, long convex and concave curves, shallow and deep V-cuts, plus many more. This tool is so versatile, it is often used as a benchmark for an individual's skill. 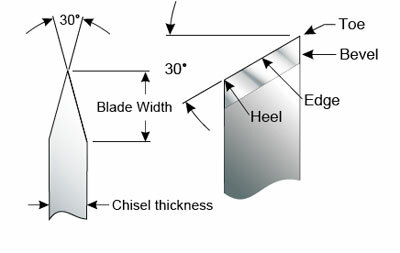 From the manufacturer, the bevel angle may be too long to use immediately. 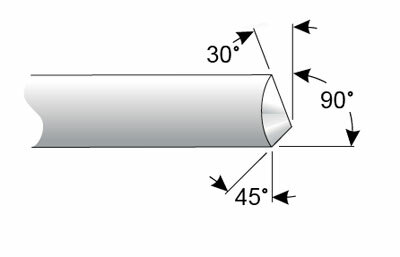 Before using, ensure the skew is ground correctly to somewhere between 25 degrees and 30 degrees, see the illustrations at the side. The skew is also sommetimes use on its side - in scraping mode - to cut dovetails for spigots and recesses. Although not strictly correct it is effective. 19 or 25mm wide (3/4 or 1in) are good starting starting sizes to choose. In its simplest form, this tool will allow you to part a piece of wood in two. However, it is also capable of delivering much more than just this one action and learning the range of cuts available will allow you to make sizing cuts for spigots and fillets on spindles - it will even turn beads if required. Supplied direct from the manufacturer, the tool is generally fit for initial use, but ensure basic sharpening is carried out beforehand. 3 or 6mm thick (1/8 - 1/4in) are good sizes to work with. This tool is also commonly referred to as a shallow-fluted gouge or sometimes, if the flute is very shallow, a detail gouge. It is most widely used for refining a shape and creating beads and coves, ogees, etc, on spindle work. No spindle turner should be without one. For optimal use and control the tool requires grinding to a 30-40 degrees bevel angle with the wings ground slightly back, known as a lady finger or fingernail grind. 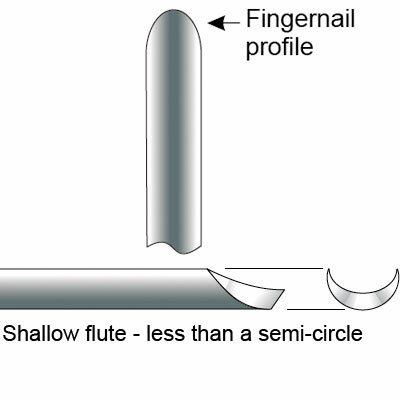 The illustration shows the fingernail profile as seen from above. A typical versatile starting size is 9mm (3/8in). This is an essential tool if you wish to turn bowls. This tool is often referred to as long and strong or deep-fluted gouge, is stronger and longer than a spindle gouge and is capable of taking heavy or fine cuts, as necessary. 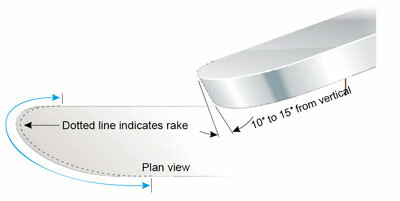 The bevel angle can be ground from 40-80 degrees depending on where it is required to cut, but a good starting grind angle is 45 degrees, as shown in the illustration. This tool is not limited to use on bowls, it can also be used on spindle work. 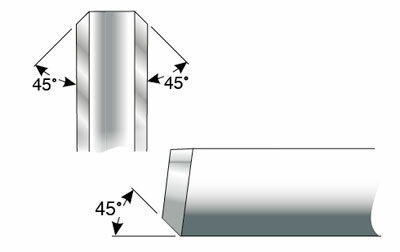 A 10mm (3/8in) gouge is recommended to start with. 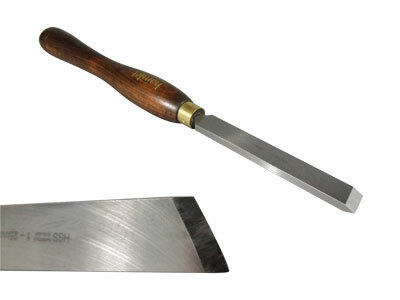 This is a one-sided scraper used for finishing cuts inside bowls and other curved forms. You will find that just the lightest touch is required to achieve the best results. Generally, novice turners feel this tool can be used to shape and remove large amounts of wood from the bowl, but this is ill advice. Delicate refining cuts are the key. 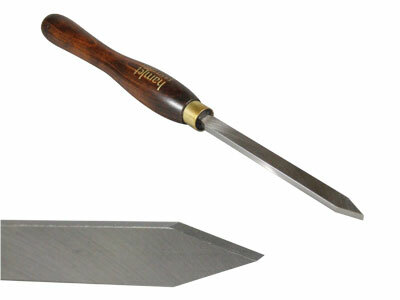 Supplied straight from the manufacturer, the scraper can often be used directly after sharpening. A 19-25mm (3/4 -1in) scraper is an ideal starting size. "I would always advise a beginner to seek advice from a recognised professional before they consult any other source"